Board flex and riding characteristics. 1. A snowboard responds to two primary inputs: The degree of tilt relative to the snow, and the distribution of pressure along its length. 2. The longitudinal flex of a board should be matched to the weight of the rider. Flex should be progressive, which is to say, in order to bend the board further, the rider should have to push harder on the board. However, a hard push should not be necessary to initiate a turn, or to make a basic side-cut turn. 3. Softer initial longitudinal flex in conjunction with appropriate camber will allow the board to more effectively maintain contact with a hard surface. The more contact, the greater the grip, and the more effectively dissonant vibrations will be damped via undulation. Given that a hard surface (ice) is less forgiving than a uniformly soft surface (machine groomed), it stands to reason that a board should be designed to optimize contact on the less forgiving surface. The harder you push against the ice, the greater the possibility that the ice will deform, or the board will deflect, unless extreme precision is involved. Once contact on ice is lost, it is much harder to re-establish than on softer snow. 4. A board should be bent from the middle, rather than either end. A board that is evenly de-cambered will be far more predictable in performance than one bent unevenly. If the tip of the board is bent more than the tail, the tail cannot follow the line scribed by the nose, and a skid will ensue. A longer board will not skid as much, due in part to swing weight, and the amount of time it takes for the trailing end of the board to begin pivoting around the moment of inertia. This is one reason why a longer board can be easier to ride than a shorter board. If, in order to turn, a board is disproportionately bent at the tip, less of the edge is effectively engaged in the turning process. This means that less of the board is involved in dampening vibration that will occur through travel over an uneven surface. The margin of error for the rider becomes smaller as well. With less undulating edge contact, any mistake is magnified. Aboard that is bent evenly will feel sharper, and require less edge maintenance. 5. If a board is bent evenly, the turn radius can be tightened at a given edge angle primarily by ‘pushing harder’ with both feet. Assuming the bindings are set close to the ‘sweet spot’ of board flex, this type of pressuring movement can be done effectively and with great accuracy. In order to modify the turn further, pressure can be redistributed either fore or aft to tighten or open up the turn radius. Again, if the board is bent evenly, simply removing previous inputs (by relaxing, for instance) will tend to neutralize the behavior of the board on the snow. If the board is bent from the middle, with more or less even weight distribution from foot to foot, the increased loads associated with a change in direction are shared between two legs rather than just one. This will delay fatigue and allow for greater dexterity, as there is less muscle involved in simply supporting the rider. If a board is primarily bent at the nose, the front leg is subjected to higher loads than the rear leg. In order to delay fatigue, the front leg must then be straighter than would be considered optimal. A straight front leg does not allow for any lateral movement of that knee via the hip and ankle. All edge-angle adjustments must then be made by moving the hips into or out of the turn. Lateral hip movement is not particularly accurate, and, on the heel edge, will tend to further overload the tip of the board on turn initiation. 5a. Skidding is not a bad thing. Effective skid is a means of altering the path the snowboard takes, without changing the tilt of the board relative to the snow. There are, however, at least two means of breaking the edge of the board free and inducing a skid. The most common is rotational in origin, and is hard to do accurately,and is therefore not recommended for high edge, high-speed use. (Rotational movements require secure footing to start and then arrest). The less common option is to selectively overload the tip of the board, until it bends into an arc that the rest of the board cannot follow. (In other words, if the rider places a majority of weight on the front foot for a moment, there is nothing left to bend the back end of the board, which re-cambers enough to swing out of the arc scribed by the front of the board). This technique has been present in off-road rally driving for many years; kick out the back of the car until the car points in the desired direction, then re-establish traction and boot it. If a board is too stiff, and if the rider is not standing equally weighted on the dynamic center of board flex, it is difficult to execute a skid in this manner. On the other hand, if the rider is correctly mounted, on an appropriate board, it takes very little input to induce and correct a skid, simply by moving from one foot to the other. As this foot-to-foot movement is in line with the travel of the board, it is very easy to modulate, and does not create rotational dissonance. This maneuver can also be done at very high edge angles, providing the rider with a precise means of affecting a turn without much actual movement. 6. In order to exit a turn cleanly, a rider can utilize rebound of the board The correct timing of pressure distribution from one foot to the other will allow the board to move out from under the rider to the next edge. The last point of contact at the end of each turn should be under the rear foot. If a board is primarily bent at the tip, the board will eventually ‘stall’ along the arc, and all rebound energy will be dissipated in either chatter or skid, or a combination thereof. The rider must then make some sort of vertical movement to cross over the ‘dead’ board to the other edge. Vertical displacement of a rider’s center-of-mass is hardly ideal, except at the lower levels of rider development. Similarly, ‘cross-over’ is not an acceptable means of turn initiation/completion except for long radius turns on fairly wide slopes. 7. It is not necessary to actively load the nose of a board in order to initiate a turn. This ‘forward-pressure’ concept is a fallacy left over from the days of long straight skis and ‘by-the-numbers’ ski instruction. Due in part to exaggerated side-cut dimensions, snowboards and the current generation of alpine skis will readily de-camber as soon as they are put on edge, assuming that their overall flex has been matched to the weight of the athlete. Back ‘in the day’ when skis were long, stiff, and when one-size-fit-most, turn initiation was facilitated by hammering the front of the ski with a lot of knee drive. Once the turn was about half completed, it was customary to step to the other ski and begin anew. The step move was necessary due to the lack of ‘return’ (productive rebound) from the outside ski, which was most likely skidding. With both feet attached to a snowboard, this independent foot movement is not an option. Therefore, it is not a good idea to replicate this mode of skiing on a snowboard. If, however, a rider has a board that is too stiff for their weight, they will find it difficult to bend the board from the middle, and thus must pounce on the nose at the start of every turn. 8. An alpine board should be fairly stiff torsionally. If you accept the notion that the longitudinal bend in a board is affected by its angle relative to the snow, then it follows that a board that is twisted will be trying to make turns of several radii, at the same time. This property is hardly conducive to grip on hard snow. Ski manufacturers in the last twenty years frequently called attention to improved torsional rigidity of their product, precisely because it improves edge hold. Since a ski is a snowboard and vice-versa, does it not stand to reason that boards should be stiff enough torsionally to fully resist deflection under load? Given that a World-Cup grade skier is not trying to twist their skis to affect ski performance (and how would they), why would it be necessary, or desirable, to do so on an alpine snowboard? Just because you can do something with a piece of equipment does not mean that you should. 9. Ideally, as viewed head-on, a line drawn from the rider’s c.o.m to the board should bisect the plane of the board at 90 degrees, at a point halfway across the board, regardless of where in the turn the rider may be. There should be no slop between the boot and the binding. There should be no slop between the binding and the board. Similarly, there should be no flex in the binding itself. Any flex in the system should be built into the boot, and should mimic the flex in the joints of the lower extremities. Flex points in the boot should be placed at the nodal points of the ankle joint, as to maximize the synergy of the rider’s skeleton and supportive plastic exoskeleton. The rear boot should have more flex, both fore/aft, and medial/lateral, than the front boot. Such flex should be incrementally adjustable, in both range and firmness. If there is flex and slop in the boot-binding interface, the first sentence of this section (#9) cannot be consistently achieved. Since the ankle joint and the knee joint have limited range of medial/lateral movement, free-play in this area will use up all of the movement intended to tilt the board. This means that a rider has to move their c.o.m a greater distance to the inside of each turn in order to achieve an effective angle between the board and snow. As stated earlier, movement of the c.o.m is slower and less accurate than a movement of the snowboard under the c.o.m. If a certain amount of body mass must be moved in one direction (starting with the board flat on the snow) to tilt the board enough to turn, the same amount must be moved twice that distance to achieve an equivalent edge angle for the opposite turn. It doesn’t take much figuring to realize just how much ground is covered in the time it takes to get off of one edge and onto the other. With slack in the system, muscles of the lower extremities will be used in an attempt to control the wobble of the board that inevitably accompanies a flexing interface. Muscle tension in the lower extremities serves to translate any dissonance between the snow and the board to the rider as a whole. 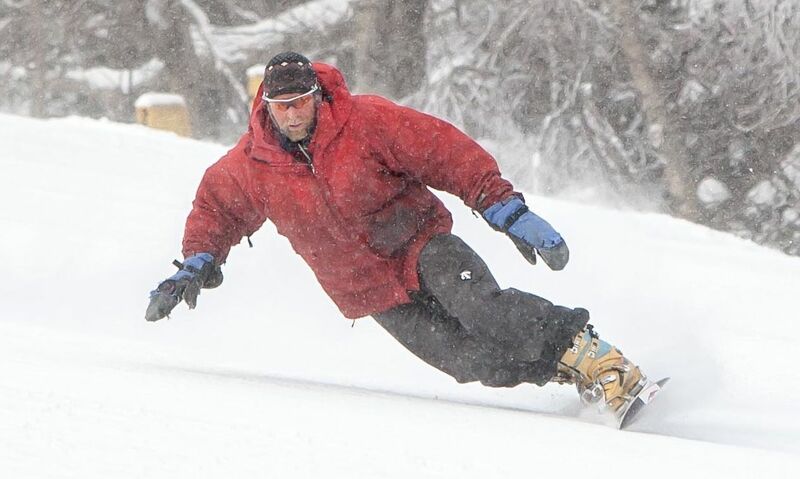 If ‘shock’ travels up the chain to the upper body, the upper body cannot function as a stabilizing mass, and rather becomes a destabilizing mass, interfering with board-snow contact and performance. (Analogy: A shock absorber with stuck valving). Given the mass of the average rider, and the rigidity and length of the average board, it is not surprising that binding parts bend and break due to the shock loads they are repeatedly subjected to. 10. In order to succeed, alpine snowboarding needs to be more accessible to more people. This indicates user-friendly equipment, to facilitate enjoyment of the sport with fewer experiential hours. One key to success on an alpine snowboard is a boot/binding interface which has been properly set up for the rider in question, on a board with appropriate performance characteristics. The single most effective means of moving an alpine board to and from edge is accomplished via inversion and eversion of both feet, facilitated by articulation in the hip sockets. The effect here is remarkably like steering and counter-steering a motorcycle, whereby the base of support is moved out from under the center of mass to create the appropriate lean angle. The articulations of the ankle joint are very similar to the steering axis of a motorcycle. Point the toes/front wheel right, and the system will arc left. Such movement on an alpine snowboard is simply not possible without proper and accurate interface set-up, as joint mobility will be blocked by structural collapse and/or dissonant muscle tension. Articulations of the ankle joint are the means by which we remain upright in our daily lives. This system has been at work ever since we learned to walk as infants, which means it is effective, accurate, fine-tuned, and does not require a conscious effort to function. Articulations of the ankle are also largely independent of the movements of the knee and hip. This implies that if initial board tilt is achieved primarily with the foot, the flexing and extending of the leg may then serve as a long-travel suspension system, without altering the contact angle between the board and snow. A. Boots need to be more anatomical in shape, with stiffer sole blocks, and provisions for adjustment of forward flex, medial/lateral flex, and cuff alignment, as well as the forward tilt of the boot board. B. Bindings need to be both rigid, and fully adjustable. Using flexible bindings does little to facilitate progress, simply because this does not allow the rider to control the board with intuitive movements of the foot and ankle, and demands instead that the board be manipulated with successively larger parts of the body. (If you believe otherwise, you are cordially invited to ride the Emery Surf, available in the early nineties). Increasing binding flexibility as a means of detuning board performance is akin to lowering the tire pressure on a sports car to make it less responsive for an unskilled driver. C. Cant and lift are almost universally misunderstood. If you are under the impression that inward canting is for knock-kneed riders, or that outward canting is for bow-legged riders, you are missing the point. Similarly, toe and heel lift should not be used primarily to allow for a wider stance. D. Cant and lift need to be independently adjustable, to at least 1/2-degree increments. Given that the balancing mechanisms of the human organism work to an extremely high resolution, (mere tenths of a degree of surface tilt) this is not an unreasonable demand, particularly since imbalance leads to muscle tension, which creates fatigue and lockout of a rider’s suspension system. E. The role of foot support needs to be clarified. All footbeds / orthotics are not created equal, just as all feet will not benefit in the same way from foot support. Gains can be made both in terms of feedback through greater plantar surface contact, as well as with joint articulation by accounting for specific support requirements. 11. Using ‘racers’, (their imitators), and their preferences as a justification for equipment design is specious at best. The sport of snowboarding is too young to assume that an optimal technique has been established. One has only to look at photos from the Turin Olympics and compare them to photos from 10 or 15 years ago, to realize that snowboard racing has not come that far, in terms of approach and technique. At present, the competition seems to be about who has the largest bundles of quick-twitch muscle fibre, rather than who is most adept at manipulating a snowboard at a high rate of speed. In the past 15 years, snowboard racing has gone backwards. Witness the absence of Super-G, GS and slalom, set on courses with rhythm changes, offsets, flushes and delays. PGS, the format and courses, looks a lot like professional ski racing. It is worth noting that the Pro Ski Tour has been dead for years. In all fairness, ‘top level’ competitors cannot afford the risks associated with trying to overhaul their present technique and hope to succeed during the following season. Old habits die hard. When ‘shaped’ skis were making inroads in ski racing, many competitors found that their technique was totally inappropriate for the turning characteristics of their new skis. Some were able to adapt, some were not. Younger skiers with less to unlearn had an easier time of it. The inevitable paradigm shift has yet to occur. 12. Heat moldable liners are not appropriate for performance riding. When Raichle introduced the thermofit liner, about 10 years ago, the consensus was ‘warmth and comfort without performance’. Telemark boots have been available with a heat-moldable liner for longer than snowboard hardboots, and the consensus remains the same. To balance effectively, the human body relies on its sense of touch with regard to the supporting surface and spatial awareness of the supporting mechanisms. The more vibration-transparent the materials between the rider and the ground, the faster the feedback loop will function. This in turn means more accurate and timely movements, thus better balance. With softer, more vibration-opaque materials between the boot shell and foot/lower leg, and/or between the board and binding, the feedback loop slows down, and movements become less intuitive and more algorithmic. The best one can say about heat-moldable liners is that they allow the inexperienced boot buyer to get their foot in the appropriate shell size, due to the fact that the liner is generally softer, thinner and less constricting than a ‘regular’ liner. 13. Hardboot snowboarding can be a lot of fun, and the enjoyment increases as the process becomes more fluid, more intuitive, and less ‘learned’ in execution. If points #1-12 are not observed, a rider will need to make greater contortions of the body to adapt to somewhat unfavorable operational tendencies of the snowboard. This leads to greater fatigue in a shorter time frame, and increases the likelihood of injury, due to both inappropriate and continuous stresses on the body, and crashing due to unintentional inputs to the board at the wrong time. 14. With apologies to Chris Carter, “The truth is out there”.